With approximately 181 million visitors annually, not to mention thousands of animals residing on tens-of-thousands of acres needing daily upkeep, the water and carbon footprints of America’s zoos have become a real “beast!” Moreover, the non-profit nature of most zoos oftentimes makes reducing that footprint out of the question, economically speaking, leaving zoo administrators in a real dilemma. Fortunately, over the past few years, some of the U.S.’s largest zoos are thinking creatively, implementing change, and setting themselves up as role models for others to follow. Some of them are even taking the above-mentioned financial hit, realizing the long-term gain to the environment will ultimately be of greater value to everyone. One such zoo leading the way is the Detroit Zoo, which has completely phased out the sale of bottled water, replacing them instead with the sale of reusable water bottles and refill stations. Economically, the switch has hurt – with two years of bottled water sales estimating $500,000 vs. the $38,850 brought in from two years of refillable bottle sales. Environmentally, however, the savings are beyond value. First, it “costs” twice as much water to produce the disposable bottle as the contents of the water bottle itself. Moreover, the zoo estimates that this switch is keeping more than 60,000 single-use water bottles annually out of landfills. In addition, the Detroit Zoo is currently reusing approximately 10.5 million gallons of water annually through its rain barrel and recirculation system for landscape irrigation, and is on its way to completing a $2 million project to increase energy efficiency. 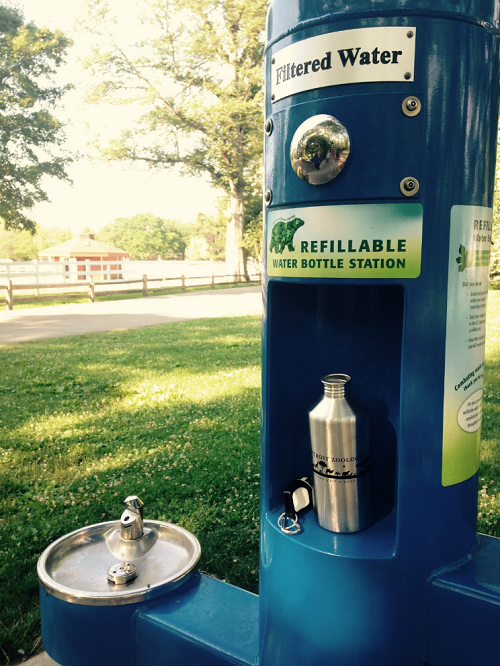 Water responsibility efforts are also underway at the Cincinnati Zoo & Botanical Garden. Their recent efforts to repair and upgrade water systems, as well as change water “behaviors,” has reduced water usage by approximately 168 million gallons annually – not only saving water, but saving the zoo over $5 million in water bills. Other green innovations at the zoo include use of pervious pavement allowing for the capture and storage of thousands of gallons of rainwater for rain gardens and green roofs topped with living plants instead of shingles. Faced with record droughts in the state of California, the well-known San Diego Zoo has partnered with the San Diego Water Authority and San Diego Zoo Global in the past year to move toward water conservation practices. The efforts include everything from reuse and recycle practices at the zoo, to education for its millions of visitors. And not to be left out, the Bronx Zoo which, in addition to other practices, has had its head in the toilet! With more than 1/2 million people per year utilizing the zoo’s restroom facilities, the Bronx Zoo has been able to save more than 1 million gallons of water annually by converting to foam-flush toilets. With these longstanding and well-respected zoos leading the way, more are sure to follow – and many already are following their own trail to reduced water footprints and increased environmental responsibility.